In a phase 2b clinical trial, M72/AS01E provided 54% protection against active pulmonary TB. A new vaccine candidate shows promise for preventing active pulmonary tuberculosis (TB) in adults infected with Mycobacterium tuberculosis. The vaccine, M72/AS01E, provided 54% protection against active pulmonary TB. In a randomized, double-blind, placebo-controlled study, HIV-negative adults ages 18 to 50 with latent M tuberculosis were randomly assigned to receive 2 doses of the M72/AS01E vaccine or placebo a month apart. 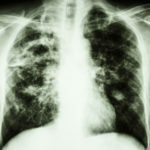 Researchers evaluated the safety and efficacy of the vaccine against progression to bacteriologically confirmed active pulmonary TB. Of the 1623 participants who received 2 doses of the vaccine, 10 went on to develop tuberculosis, reflecting an incidence of 0.3 cases per 100 person-years. Of the 1660 participants who received placebo, 22 went on to develop tuberculosis, reflecting an incidence of 0.6 cases per 100 person-years. Unsolicited reports of adverse events were more common in the group that received the vaccine (67.4% to 45.4%), with investigators attributing the disparity to injection-site reactions and flu-like symptoms.